I just remembered that I drew this in my Architectural Design class. 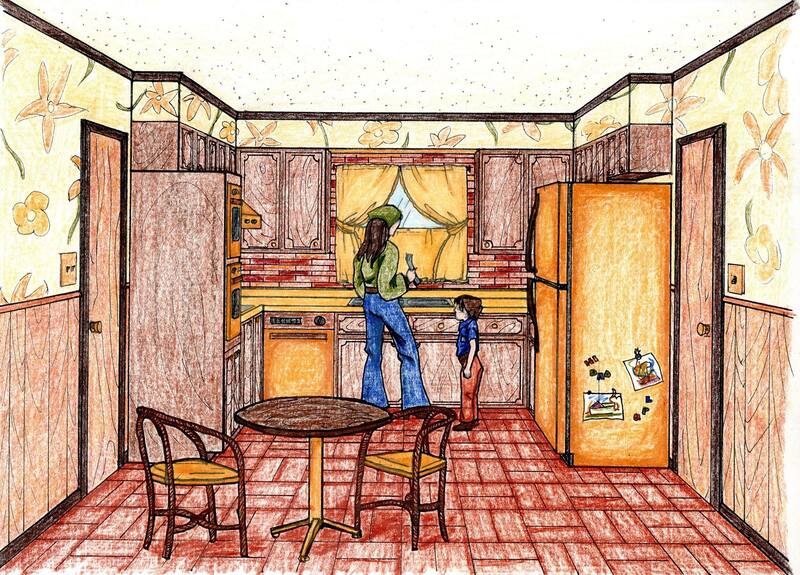 I called it,”That 70s Kitchen”. My teacher questioned my taste level, but I still got an A. lol. I should have put a scallop between the cabinets over the window. Or those curved shelves for keeping knick-knacks on. Okay, maybe. 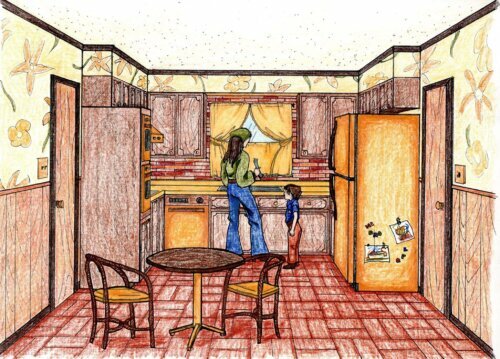 But this That 70s Kitchen: I Love You Just the Way You Are. This drawing took me back to my childhood. My parents built a log cabin in the woods in 1977. In addition to the log walls, my mother selected a simple brick red colored wall paper. We, too, had gold appliances including a refridgerator with a kick opener on the bottom. The neighbor’s dog learned how to use it and once stole two pounds of hamburger. Our floors were the same brick red vinyl as in the drawing. My mothers, always a bit a head of the times, selected a creamy Corian counter top. I loved that country kitchen. Thanks for sharing your 70’s kitchen. This is pretty much my kitchen, sans the harvest gold fridge and dishwasher which have been replaced with, gasp, white. I’ve redone the flooring and there is no wallpaper. My window covering is the original roman shade in wood and gold thread. I love my 70s kitchen. No pom poms on my Roman shade. Gold and brown yard with wood. Still going strong 34 years later. Ohmigoodness. My kitchen looks like that. The other side has the white replacement appliances. Sigh. What’s very funny to me about this artwork is that aside from the appliance, wallpaper and curtain colors, and the flooring (because I’m fairly certain that’s meant to be linoleum), the other elements are very much like my parents’ kitchen from 1971 to 1975. Our appliances were avocado instead of harvest gold. We did have that exact paneled wainscoating, and the cupboards were very, very similar. And if I squint, the linoleum does look like their 70’s plaid indoor-outdoor carpeting in the kitchen. Very good job!